It is thought that the idea of track racing evolved from the desire to hold coursing events within smaller enclosures. Smaller that is than the original three miles of course which was used until then. The idea of coursing within enclosures had the obvious benefit that spectators could easily view the proceedings. A course of fences, complete with holes through which the hare could run, was set up within the enclosure and the hounds were released (or "slipped") in pairs. They were awarded points for the way in which they pursued the quarry and not necessarily for being the dog that caught the hare. I have found many sources on the internet which tell us that the first Greyhound races, using a mechanical hare, took place in the USA around 1912. Another source quotes the first such race to have been at the Welsh Harp, Hendon, England, when six dogs raced down a straight track in pursuit of a mechanical lure. This event is said to have taken place on 11th September 1876, some 36 years before the opening of the first track in America. Unfortunately the Welsh Harp experiment was deemed to be a failure. The racing took place over a straight course of 400 yards. It is thought that transport difficulties in getting to Hendon were somewhat responsible for the failure of the sport to catch the public's imagination. Indeed, the very fact that the course was straight and proved no test of a greyhound's skill caused the public to quickly lose interest. Despite an enthusiastic review in The Times, which dubbed the new sport "Coursing by Proxy", interest in the sport quickly waned and died. Greyhound racing in England would not come into existence again until 14 years after the first American tracks were operational. In 1912 an American named Owen Patrick Smith invented a mechanical hare which could run in a circular path. Later that year, he opened the first Greyhound Racing Stadium in California. Such was the success of the new sport that within six years he had opened a further 25 tracks around the USA. Quite how Smith became involved or even interested in greyhound coursing is something of a mystery. He had an intense dislike of bookmakers and was as a matter of fact, totally opposed to any form of gambling. It was after he encountered increasing opposition to his coursing events from anti-blood sport lobbyists that he decided to consider the possibility of holding coursing events using a dummy hare. His first attempts were crude and simple, sometimes involving nothing more technical than a stuffed rabbit attached by a rope to the back of a motor bike. It took almost 14 years for him to refine his ideas and develop a hare which was carried along a rail onboard a mechanical trolley. As in England, the idea of greyhounds chasing a synthetic hare was not taken immediately to the hearts of the public. The fact that Smith totally refused to allow any form of betting at the first tracks almost caused the demise of the sport before it had a chance to gain a real foot hold. Only when Smith allowed bookmakers to operate on the tracks, at the insistence of his partner George Sawyer, did the new sport prove to be a success. In 1925 Charles A. Munn, a shrewd American businessman, realised the international appeal the sport would have and struck up a deal with Smith and Sawyer for the rights to promote the greyhound racing in Britain. Finding other supporters proved to rather difficult however. With the General Strike of 1926 looming, the two men scoured the country in an attempt to find others who would join them. Eventually they met Brigadier-General Alfred Critchley, who in turn introduced them to Sir William Gentle JP. Between them they raised £22,000 and formed the Greyhound Racing Association Ltd. When deciding where to situate their new stadium, Manchester was considered to be the ideal place because of it's sporting and gambling links. Close to the city centre, the consortium erected the first custom built greyhound stadium and called it Belle Vue. On Saturday 24 July, Belle Vue hosted the first greyhound racing meeting. Six races with seven dogs in each race were held in the first meeting. Fifty years later a stand was named after Mistley, the winner of the first race. Running the quarter mile flat course in 25 seconds, Mistley romped home eight lengths clear at 6-1. Later, Belle Vue increased the number of runners per race to seven, but after the formation of the NGRC in 1928 the maximum number of dogs per race was set at six. After the end of that first meeting, the GRA were horrified to find they had made a loss of £50 on the night, after attracting only 1700 people to pass through the turnstiles. The following week the crowds turned out in force. Over 16,000 people shuffled through the turnstile and "going to the dogs" became the national pastime. When racing resumed at Belle Vue after the winter break, 1927 saw greyhound racing continue to increase in popularity. By June, the stadium was attracting almost 70,000 visitors a week. The revenue accumulated from the ever growing crowds made the GRA into an extremely financially viable concern, and it wasn't long before the consortium began to cast their eyes south, with the intentions of taking their ideas to London. London had hosted the Olympic Games in 1908. Several stadiums had been built especially for the event, but the greatest of them all was the White City. It was here, on the 20th June 1927, that the GRA decided to hold their first greyhound meetings in the capital. When racing began at Belle Vue the previous year, a dog called Charlie Cranston won his first ever race at the second meeting. A year later, it was to be Charlie Cranston that became the first greyhound to cross the finish line and win the first race at the White City. Towards the end of the year the White City meetings were attracting an estimated 100,000 people. By the time the season closed in October 1927, the White City had played host to 56 meeting. During that first short season over £12,500 had been paid out to the owners of the winning dogs and many expensive cups had been presented, the most famous of which had been competed for the very first time that year, The Greyhound Derby. 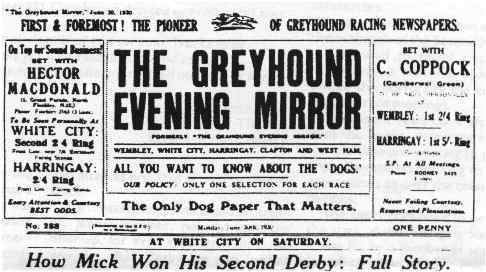 The winner of the first Greyhound Derby was a dog called Entry Badge, and in later years the race's champions would be well publicised by the newspapers until they became household names - Mick The Miller being an obvious example. It was also in 1927 that the first greyhound racing tracks were opened in Ireland and Australia. In Britain there were around thirty stadiums in operation and several under construction by the end of 1927. It was for this reason that the GRA formed a Racing Committee, which set the rules and regulations and saw they were adhered to by all the tracks which fell under their direction. In presenting to you the first volume of the Greyhound Racing Association Register, I feel sure that you will be gratified at the success with which it has already met. The Register was opened on the sixteenth of July, after the racing season had been well started, but it is my pleasure to inform you that 904 dogs have been registered. Included in this number are 183 lady owners. It will interest you to know that the first owner to take advantage of the Register was Mr Edwin Baxter, of Sarre, Kent, to whom the first certificate was issued, and by a happy coincidence, the very first dog to be entered on the GRA Register was "Entry Badge" the winner of the £1,000 Derby. The provincial owners were somewhat slow in sending their registrations, but towards the closing of the Register (31 October) a decided improvement was shown. Now that it is compulsory for all dogs that run on your Tracks to be registered, and as the Register has got well established, and appeals to owners, I feel confident that Volume II will show a marked increase in the number of dogs registered. On 1st January 1928 an independent body was set up to ensure the smooth running of the growing number of racecourses. This came about after many promoters had meetings late in 1927 and decided to set up the National Greyhound Racing Club to regulate the sport, and the National Greyhound Racing Society to take care of administration. For the next ten years greyhound racing continued to hold it's popularity. In 1934 the Betting and Lotteries Act was passed, which allowed stadiums and racecourses to operate their own totalisators. This helped to make the sport even more profitable and more popular. For a short while, after the outbreak of the Second World War, racing was banned in Britain. When the ban was lifted and racing resumed, much to the relief of the populace of the city who were sorely in need of entertainment, only day time race meetings could be held because of the restriction on lighting caused by the blackouts. In the post war years the sport gained even more popularity. Millions flocked to greyhound stadiums all over the country, eager to forget the horrors of the past years and happy to be able to go out and enjoy themselves. The GRA were hit badly by the lost revenue and tried several ways to tempt the public back to their stadiums, including the reintroduction of eight dog races. Nothing could stop the flow of spectators away from the stadiums and into betting shops and bingo halls. A slump in the property market in the mid seventies added further to the troubles of the GRA and the company was on the verge of ceasing to operate. Many tracks disappeared forever, including the White City's of both London and Manchester, before the slide was halted. Jack Aaronson, renown in the city for saving flagging companies was put in control of the GRA. It was his act of closing the loss making tracks and taking stringent money saving measures that eventually saved the GRA. Since the Eighties, greyhound racing has been witnessing a resurgence, with many new and luxurious stadia being built. As we enter the new millennium, these new stadia are once again attracting sell out crowds, flocking to enjoy the thrills and spills of live greyhound racing.